This guy showed up in a couple cameos over the past few weeks, and all we got were questions about was what figure it was. Welp, here's your answer, fishbulb! There's been a lot of fanboy complaining about DC Comics' "New 52" reboot, and not all of it unjustified. Still, there's no denying that a whole lot of good has come out of the reboot - for instance, Scott Snyder being freed up to tell one of the best Batman stories ever, adding a new wrinkle to the Batman mythos that makes sense, fits seamlessly into the existing world, and yet changes everything we knew about Batman and Gotham City. Mattel may have cancelled the DCU Classics line, but their DC figures live on in the form of the new "DC All-Stars." And DC All-Stars may have been cancelled shortly after it was announced at Toy Fair, but it came back. This time with characters that might actually appeal to someone other than the dwindling audience that was already failing to successfully support DCUC at retail! Shockingly, New 52 Batman doesn't use one of the pre-existing DC bodies, because his costume details are molded on, not just painted. The sculpt is clearly based on the Cully Hamner model sheet (itself based on Jim Lee's designs). The bat emblem on the chest is a raised element, and the body is etched with thin lines meant to suggest the edges of armor plating. 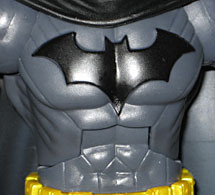 The lines sculpted into his "ab" section don't meet equivalent lines on the upper torso piece, which is disappointing. In the comic, the new utility belt is made of convex metal ampules, but on the toy it's more like small, separate pouches. Tiny pouches. The buckle is made up of beveled metal plates, so at least the two versions still have that in common. There's a blank spot in the center of the back of the belt - what's actually back there changes depending on the artist. The character sheet had an intricate containment pod that could be detached to be used as a tool; Jim Lee just drew more pods on the belt. The boots and gloves have recessed louver-like shapes that start on the rear and run around to the front, suggesting that there's a bit of flexibility to them - he's not locked in like ski boots would be, but he still gets the same stiff protection. There's raised piping and convex metal knuckles on the back of the hands, and of course razor-sharp fins on the outside of the arms. Technically he should have beveled "bat ear" kneepads, but who's going to notice those are missing? 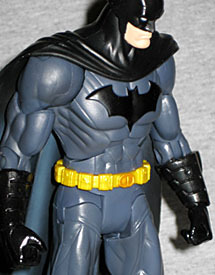 The major problem with the new Batsuit is the color - it's just too dark! Yes, Batman is a creature of the night, but you still need contrast to make the design work. With no oval around the batsymbol and no trunks to break up all that grey, any time he loses the belt he ends up looking like a Ghostbuster or something. Clearly recognizing this problem, Mattel painted some subtle highlights on the folds of his cape, so at least he's not totally dark. It only shows up strongly under a harsh light (one about as bright as, say, the flash from a camera), which is why we toned it down in all the other photos. It is there, though, make no mistake. The DC All-Stars line forgoes things like "accessories" and "Build-A-Figures" and "being carried in stores," but the articulation is still the same as ever. The torso hinge seems slightly restricted, however - it's not that any of the outer surface is getting in the way, so there must be something inside the torso that's preventing the figure from moving as far as he should. That sounds stupid when you say it, but then you remember that Mattel has a history of doing exactly that with their MOTU Classics and you begin to wonder. 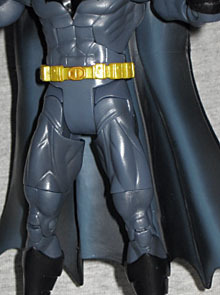 DC Direct made a New 52 Batman of their own, but while the sculpt was truer to the comics, the articulation was crummy. 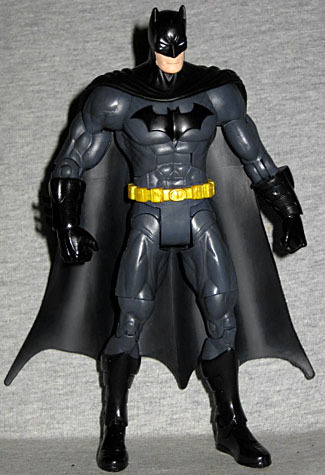 This is a nice, new Batman, we just really wish he came with a batarang or something - and that you could find him at retail.